Tall women's plus size swimwear is, let's face it, a challenge. Trying to shop for a bathing suit that's perfect for not only your shape but that will, also, accommodate your long torso can really be frustrating. So, let me help you out. Here you'll find long torso, ladies plus size swim suits that are not only hip and stylish, but are fashioned in such a way as to flatter any figure. The Longitude swimwear brand of tall women's plus size swimsuits offers strategic swimwear designs which are created to hide problem areas and give you a smoother and slimmer look. You'll find plus size bathing suits in a wide range of bold colors, striking patterns, and glamorous designs meant to accentuate your body. Not only that, but these suits are cut with extra length in the body for those who need it. Longitude's unique tall women's plus size swimwear is the perfect combination of fit, comfort, and style that appeals to all shapes and sizes. TALL TIP: Swimsuits For All is the place to check out Longitude swimsuits . They offer many of these styles on sale throughout the year! Athleta - $$ | Athletic clothing for the active woman. Carries activewear pants, casual dresses and skirts, workout tops and tanks, and one piece and tankini swimwear in tall and extended sizes. See the special Tall Sizes section. JCPenney - $ | Fashionable, classic-style clothing. Carries jeans, pants, tops, sweaters, skirts, suits, jackets, activewear, sleepwear, and maternity in tall sizes. Also carries Longitude women's plus size swimwear and other tall swimsuits styles. In the Swimsuits section, choose Longitude under the Brand menu or select Talls under the Size Range menu. L.L.Bean - $ | Casual, relaxed clothing. Jeans and pants in tall sizes for women 5'9" and over (according to the size chart). Also sells one-piece long torso swimsuits. Find misses and women's long torso bathing suits in the Swimwear section. Land's End - $ | Classic, casual style. Offers tall sizes in jeans, pants, and tops. Also carries ladies long torso plus size swim suits and tall tankini swimwear. In the Tall section of Women's apparel, select the Swimsuits cateogry. 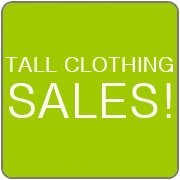 Long Tall Sally - $$ | Specializes in clothes for tall women. Offers women's tall clothing such as jeans, pants, tops, sweaters, dresses, skirts, suits, coats, activewear, sleepwear, and maternity as well as one-piece long torso swimsuits and tall tankini swimwear. Based in the U.K. Also in the U.S. and Canada. Swim Outlet - $$ | Specialty swim shop. Offers a collection of ladies long torso fitness swimsuits. Select Women's Swimwear, then Fitness Swimwear, then Long Torso. Also carries the Longitude line of tall bathing suits. Select Longitude under the Shop By Brand drop-down menu. Swimsuits For All - $$ | Specialty swim shop. Carries the Longitude line of tall women's plus size swimsuits including one-piece, swimdress, shortini, skirtini, and tankini swimwear. Large selection of long torso swimsuits in a variety of prints and patterns from size 8 to 24W. Can talk with a swimwear specialist for style recommendations. Swimsuits Just For Us - $$ | Women's plus size swimsuits. Carries a selection of Longitude long torso one-piece bathing suits made specifically for tall ladies in up to size 24W.